15 years back I left Assam, India making a new home in Connecticut, USA. I left a few festive, fair, smell, fragrance, family, friends and much more. While you leave something at the same time you gain a few too. You all might know that at this time in India, Indians celebrate the most glorious festival Diwali "A celebration of light". As I am from the eastern part of India, Bihu is the fulcrum festival. After coming to the USA, we started celebrating Diwali as equally as Bihu. We love preparing sweets and exchanging with friends and putting lights to decorate the house with candles and Diyas earthen lamps. With our neighbor, we celebrate Diwali where kids perform dance and music with all the cultural programs and an array of good Indian food. We celebrate our roots and heritage, trying to give kids the essence of India. 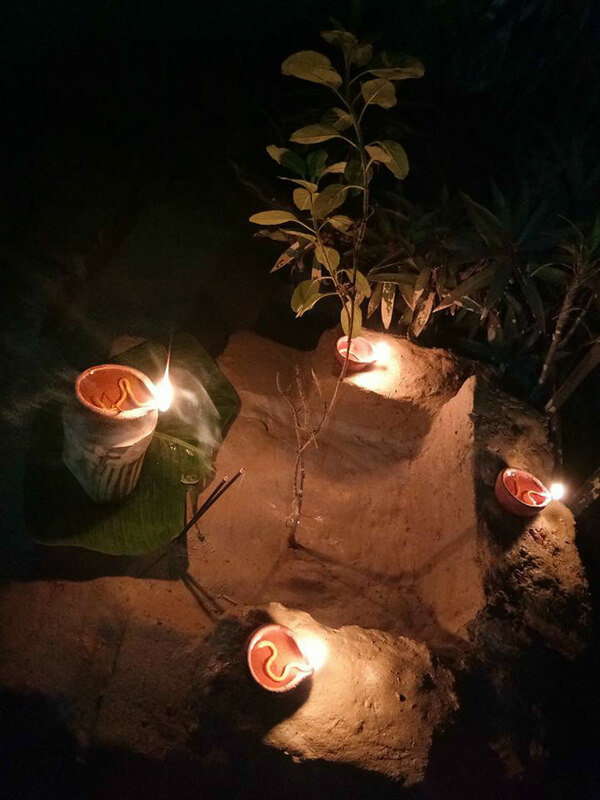 Along with Diwali, back in Assam India, we celebrate one festival called Kati Bihu or Kongali Bihu. This Bihu is not as grand as Rongali Bihu or Bhogali Bihu. All Assamese festivals are associated with harvest. Since this Bihu falls before the harvest that's why it is called kongali Bihu, Kongali means poor. Place Earthen lamps (diyas) in storage (bhoral), gate and front of the kitchen for praying for good harvest according to local belief. Planting basil tree and placing earthen diyas and offering prasad (Soak chickpeas and Moog with fresh cut fruit) is a ritual and kids visit you for prasad. As a kid, I used to visit our neighbors and friends. 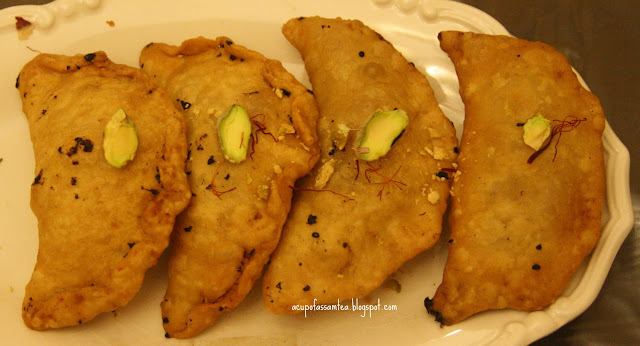 But later when I grew up, I recall kids were not coming for prasad and the tradition slowly becoming extinct. Now when I look back at those nostalgic years, it lights up my heart just like Diwali Diyas. Here along with Diwali, we celebrate Halloween too. My kids go for Halloween Trick or Treat in our close tidy neighborhood for candies. I see a glimpse of my childhood in them, celebrating Kati Bihu. With our Halloween decore Diwali Diyas and candles get equally placed too. Our whole neighboorhood fills up with Halloween decor and Diwali Diyas. Everything oozes same merriment and joy of festivity. I couldn't differentiate whether it is because of Halloween or Diwali. Thanks for sharing your traditions from India. I didn't have any clue about these festivals and celebrations and it's neat to learn about. Unfortunate it's going extinct, because they sound so fun. True, as we move from place to place, some changes do occur. How was your festival this year? Wonderful write. Few of my friends are Indian and I went to a diwali evening once. The food was always amazing. Thank you so much for sharing this part of the culture. Its fascinating to hear celebrations in different cultures the more we kniw about each other the more we can appreciate our differences. I am glad you shared this kind of tradition. This is so awesome. I have a few friends in India and I think they celebrate diwali like a lot of lights. It seems so fun. So glad that you have shared about Bihu and it feels so nostalgic with our childhood memories. That is the reason i make sure to celebrate all the festivals with my kids. I always love reading about traditions from other cultures. It is very interesting to hear about the different things other people celebrate. I am always looking at traditions of different places. I currently have a client from England, but lives in Thailand. She is such fun to talk to. 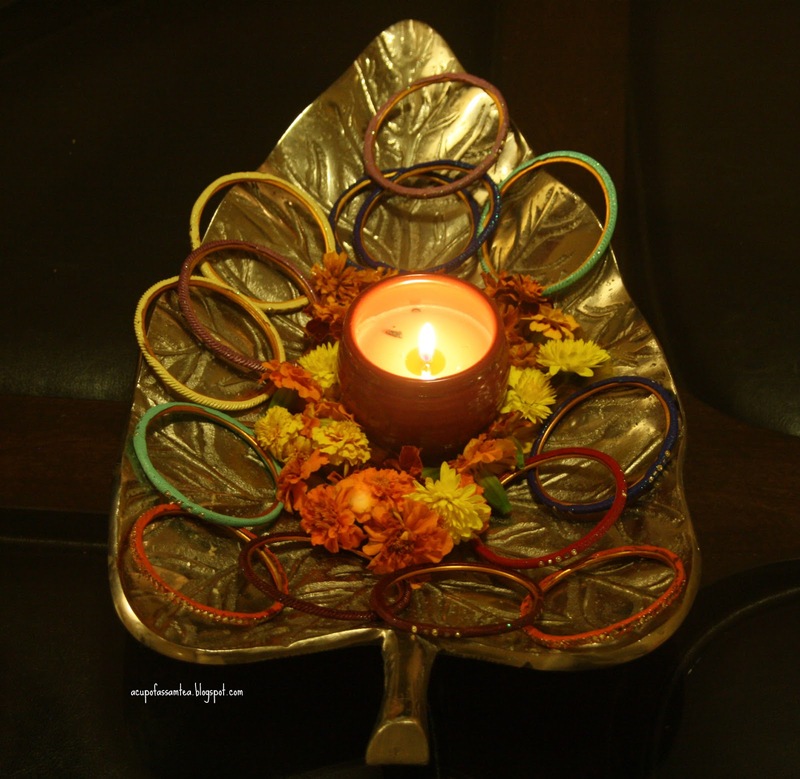 I've always wanted to learn more about Diwali, thanks for the post! This was such an interesting read! I love learning about different cultures and their traditions. Thank you so much for sharing this! It's so nice to be able to continue traditions that you experienced as a child especially special occasions/holidays like this! This is such a great post. I love hearing about other traditions. Very cool! Always enjoy learning about different cultural aspects from around the world. We have a huge Indian population in our area so always appreciate insights into that country's way of life. Though I've learned India itself is a very diverse place full of a wide array of different languages, religions and cultural aspects just within its own borders from talking with my neighbors. I love learning how different areas celebrate things so differently than we do. It is really interesting to learn about other cultures. We attend an Indian festival every year. It's so much fun and I love learning about traditions from other cultures. This is so interesting! I love learning about different cultures and traditions. My daughter too!! I've heard about Diwali but I never really knew what it is. Thank you for sharing about this celebration. This sounds amazing. Have heard about Diwali but never had the idea what's it all about. Thanks for sharing us. I've never heard about Bihu before. Thanks for educating me. Love India and the many festivals there and also how inclusive so much of the country is, in my experience. Great that you brought all the festivals together and had yet more reasons to come together and celebrate! Happy Diwali! Is the community in USA close? I bet it ain't easy to leave your hometown to a foreign place. Hopefully I get to fly to USA one day too and meet the bloggers from there! This sounds like something I would really enjoy. I hope you had a great time celebrating your holiday. I seriously want to experience Diwali Festival in person. I only saw it in videos and it looks sooo amazing! Thanks for sharing! Assam is known for its tea and the aroma is very delicious . None can beat that. I am missing that experience here wanna try it soon. I love learning about other traditions! This is a wonderful post! Thank you!